Hi ! Im looking to get some info on this guitar that was handed to me. I do know its a Sal Salvador but don't know what year is it from since its serial number sticker was torn out (don't understand why). 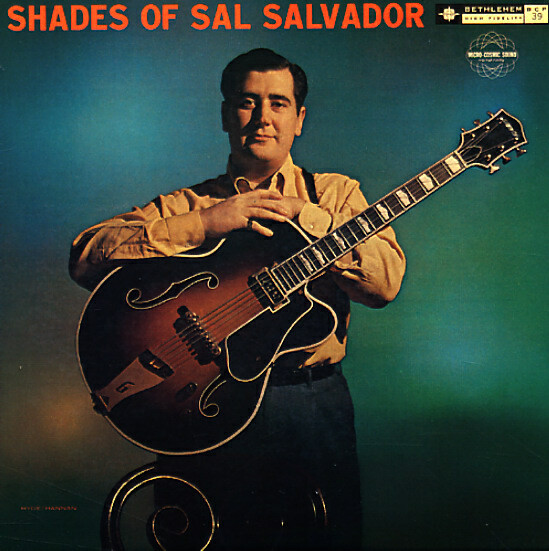 Also noticed it has a custom inlay that haven't been able to find on another sal salvador yet. Hoping Dan Duffy or anyone who has some insight on Sal Salvador's guitars see this post :). Sweet. The "phantom H" Sals are definitely the most desirable. Someone else will have to comment on how the "double fish" inlay affects value. But I'd play the shiz out of it. Score. Probably a 1957 around serial #23XXX, although the pick guard appears to be from a later era. Here's a pic of my old Sal from the #23XXX batch. Yours is in very good conditions. It seems pickguard, pickup, and knobs were replaced on mine. The binding is chipping off, I assume is rotten. Im still considering in doing a restoration once I get enough info about it. Any guess on how much its worth in this conditions ? My 6108, except for the wider neck, was called by some here as the 'Sal, Jr.'. Guard mounted controls are the coolest. They finally put his three big band albums on iTunes. It's a nice compilation of all three. His version of Secret Love is a monster. JBJ, is it the type of label that tells you '57? Plus thumbnails? No it's more about knowing and discussing this odd batch previously. These were the very first Gretsch guitars to receive thumbnail inlays for some odd reason, which is normally a 58 feature. The label, that's the clue - '57 was the last year of the blue filagree bordered label and the first year for thumbnails. So this guitar Bondi13 is a '57 model 6199 Convertible, not strictly a Sal Salvador because they were not named after Sal until '59 when the sunburst one appeared in the catalogue...and perhaps none of those were made until the 60s anyhow. What has me curious is whether yours was natural finish or if it was originally the standard 2-tone Lotus Ivory/Copper Mist or whether it was originally some other custom colour like the red one above? They appear so rarely it's great to see one emerge, although it does look like it has 'been around'! As for value that's pretty tricky because yours has been modified and has binding cancer. In my opinion in its current state it's worth around $500. I would not suggest it's worth restoring as an investment because a restoration will likely cost more than you could sell the guitar for once it's restored. So if you want to restore it to its former glory I say do it for the sheer pleasure. Or get it into whatever shape you want, maybe find a vintage DeArmond (or even a Filtertron since the guitar is already non-original). Love it, my favourite model the Convertible!